As soon as marketers began to realize the power of influencer marketing they took to it and ran. It allows you to harness the power of those that already have a relevant audience and can really increase the success of your campaigns. Though influencer marketing has become popular, most failed to consider ethical and legal questions involved in working with influencers. This has lead some to get into big trouble with the FTC. To keep from getting your company and clients in trouble, here’s what you need to do. In recent years the FTC has begun to crack down on companies that aren’t upfront about their influencer marketing. Last September, they settled charges against YouTube-based gaming network Machinima over failure to disclose payments to YouTube influencers surrounding an Xbox promotion. While the amounts paid to these influencers is likely far greater than what most of us are offering participants in our own programs, marketers must still be aware of disclosure requirements around influencers and endorsements. Last year, the FTC updated the “What People Are Asking” page for its Endorsement Guides for the first time since 2010. This guide lays out the requirements for disclosure and makes it clear that influencers must be clear that they were compensated, no matter how little they were paid. Even free products or small gifts require disclosure. 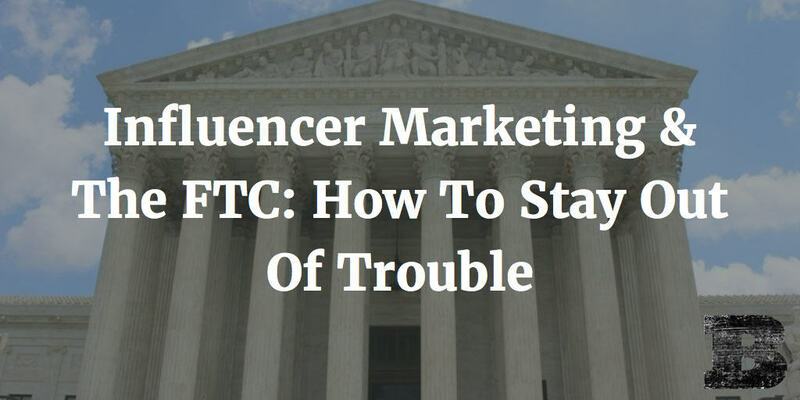 Be upfront or you might face lawsuit for your influencer marketing. In addition to disclosure, it must be made in a way that “the majority of viewers” understand that they’ve been compensated. You might choose to disclose things at the bottom of your article but if the majority of users never make it there, you’re not doing it properly per the FTC guidelines. Not sure if your program requires disclosure? When in doubt, the rules make it clear that it’s best to disclose. While the guidelines aren’t overly clear on how to go about doing so, they do make it clear that it’s far better to be on the safe side. None of us would want to be dragged into federal court and we’d surely lose any client that gets a call from the FTC because we neglected to be clear about our relationship with influencers. So how do we make sure we aren’t opening ourselves and our clients up to action from the FTC? Simple, be open about your work with influencers. If they’re compensated in any way, no matter how small, you need to make that clear from the start. Don’t wait until the end of the blog post, the back page of the ebook, end of a video, or other point most viewers never see. You need to make it clear upfront. In addition to following the FTC guidelines, Google recently released a guide to those accepting free products from companies. If you provide your influencers with any free items in exchange for their participation, they’ll need to be sure to make that clear and nofollow any links to your company, social media accounts, or other online content. Be sure to follow these guidelines too, or risk being penalized by Google for failure to comply. While the idea of angering the FTC is scary, staying safe is simple. You need to be transparent about your relationship with influencers. If they’re paid or compensated in any way, it must be made clear to all of those who see your campaign. By understanding the required disclosure for our influencer programs, we can keep out companies out of the crosshairs of the FTC and avoid leaving people feeling deceived too. A little disclosure can go a long way to preventing major headaches.